Well I made it! By the time I got to my hotel after taking the “L” into the city, I wasn’t able to attend any of the sessions presented on Friday June 3rd, so I did what any keener would do and went to the McCormack Center to pick up my registration package and scope out the place. The place was HUGE!!! Still undaunted I found my way to registration and afterwards went to check out the Advocates lounge. It was here I found some of my tribe. There is a truly amazing phenomenon that happens when you meet others like you. There is an immediate kinship and bond forged through mutual experience that immediately makes friends out of strangers. Mind you it helps that many of these individuals are my online heroes and I follow them on Twitter, chat, or through their blog. Who ever said you shouldn’t meet your heroes was dead wrong! I was immediately swept into their kindness and invited to dinner. How could I not love these people, when we have both cancer and food in common?! Day 2 was in earnest my first day at the conference. As my first time here at ASCO, I can honestly say I was overwhelmed by the sheer enormity of not only the facility, but with the number of participants, presenters and exhibitions. To give you an idea, I walked 10km yesterday and that was only in the McCormack Center. I was most interested in the lung cancer track, for obvious reasons, so it was a busy day. Poster sessions began at 8am and ended at 11, followed by oral sessions at 1 and at 3. In between, the advocacy lounge generously provided lunch. Because ASCO is so huge, many sessions overlapped and besides being in two places at once, I decided to view some of the sessions at a later time (thank goodness all sessions are recorded). At 5, I attended Lucy Kalnithi’s “book club” session where she discussed her late husband Paul’s book When Breath Becomes Air. It was a beautiful insight into their lives as patient/supporter and as clinicians. From there, I ran up to the official ASCO Tweet-up where I got to meet a few more individuals I know from the web. All in all, it was an eventful and full day at the conference. Before falling into bed, I looked over all the handouts I had collected and planned my day for tomorrow. As Jerry Seinfeld said “Hellooooooooo”. Welcome to These are My Scars. In a very long and arduous decision, I have closed my previous site and blog and decided to begin anew here. 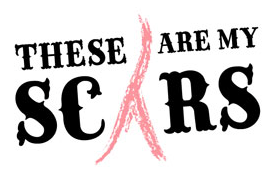 If you would like to read previous posts, you can always view them at http://thesearemyscarsorg.tumblr.com at least until I familiarize myself on how to archive here. My goal with this blog is to not only share in some of my personal experiences, but to serve as a resource for others who have been diagnosed with lung cancer. I have always thought that being “in the know” was important, but even more so when you are trying to advocate for yourself and your loved ones. There is so much information out there, but it can be daunting for a patient to find it or even understand it, which is where I want to fill the gap. As I type, I am sitting in the airport lounge getting ready to head to the Mecca of oncology meetings ASCO, where I hope to fill my brain with lots of useful information that I can share with you. Stay tuned and please forgive our appearance while we build the blog.